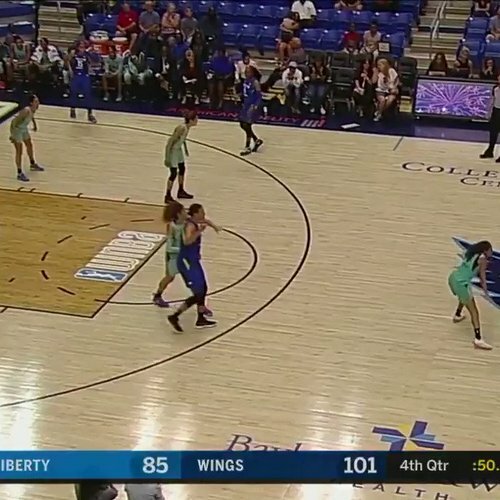 Liz Cambage scored a WNBA single-game record 53 points to lift the Dallas Wings to a 104-87 win over the New York Liberty on Tuesday. The Australia international shot 17-for-22 from the floor, including 4-for-5 from three-point range, and 15-for-16 from the free-throw line, adding 10 rebounds and five blocked shots. The 6ft 8in center broke the record with a wide-open three-pointer with 44 seconds remaining in regulation. The previous mark of 51 was set on 8 September 2013 by Riquna Williams, who did it for the Wings’ franchise when it was located in Tulsa. Glory Johnson and Allisha Gray each added 13 points for Dallas, which won its first home game against New York since 2016. Dallas coach Fred Williams was ejected from the game with 1:44 remaining in the third quarter. New York took its first lead of the game, 70-69, on the next possession, but Dallas opened the fourth quarter on a 12-3 run and cruised from there. The 26-year-old Cambage outscored the Liberty’s entire starting five by 10 points. Kia Nurse scored 25 points, with four 3-pointers, for New York (7-15), which saw its two-game winning streak snapped. Tina Charles added 19 points. Cambage, who helped lead Australia to an Olympic bronze medal at the London Games in 2012, returned to the Dallas franchise this year after sitting out the past four seasons. She was drafted by Tulsa with the second pick in 2011 behind Maya Moore. Moore is third in the WNBA for most points in a game, scoring 48 in a double-overtime game in 2014. Phoenix’s Diana Taurasi had 47 points in a three-OT game in 2006.